Osaka Gas Engineering Co., Ltd. (OGE), a subsidiary of Osaka Gas Co., Ltd. (Osaka Gas)(TOKYO:9532), has entered into an agreement to provide consulting services on construction of LNG receiving terminals of CPC Corporation, Taiwan (CPC) and Taiwan Power Co., Ltd. (TPC) respectively. In CPC’s third LNG receiving terminal construction project, OGE will conduct Front End Engineering & Design (FEED) and provide technical consulting services on regasification facilities as part of building a 3 million tons per annum (mtpa) LNG receiving capacity in the first phase of a 6 mtpa LNG terminal project planned to commence operation in 2023. With this agreement following the previous one signed this March for consulting services on engineering and construction of four full containment pre-stressed concrete (PC) LNG tanks for the terminal, OGE will provide consulting services for the entire first phase construction project. In the meantime, with TPC, OGE has reached an agreement to conduct FEED and provide technical consulting services to TPC for the first time on five full containment PC LNG tanks and regasification facilities for TPC’s Taichung LNG receiving terminal, which is planned to be built with a 4.1 mtpa capacity and scheduled to start its commercial operation in 2023 along with a power plant in Taichung area. With these contracts, OGE plays an integral part in basic designs of all the LNG terminal projects currently going forward in Taiwan, where LNG import has been growing to meet the increasing power demand while its government plans to phase out of nuclear power generation by 2025. 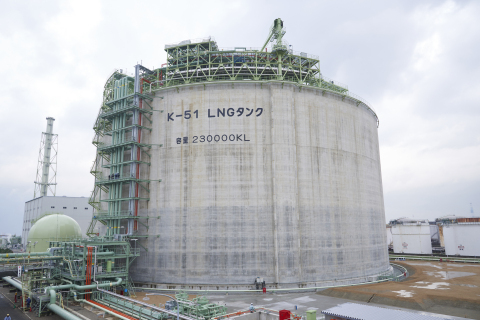 Globally, Osaka Gas has been providing consulting services on safe and efficient construction, operation, and maintenance of LNG receiving terminals under 23 contracts in 10 countries, including CPC’s LNG receiving terminals in Yong’an and Taichung, leveraging its knowhow gained through more than 40 years of experience. Under its long-term business vision "Going Forward Beyond Borders 2030,” which focuses on overseas energy markets as one of the growth areas, the Daigas Group pursues its endeavor to expand its energy businesses globally along the value chain. are introduced on the “ENTERPRISE FUTURE” web page.